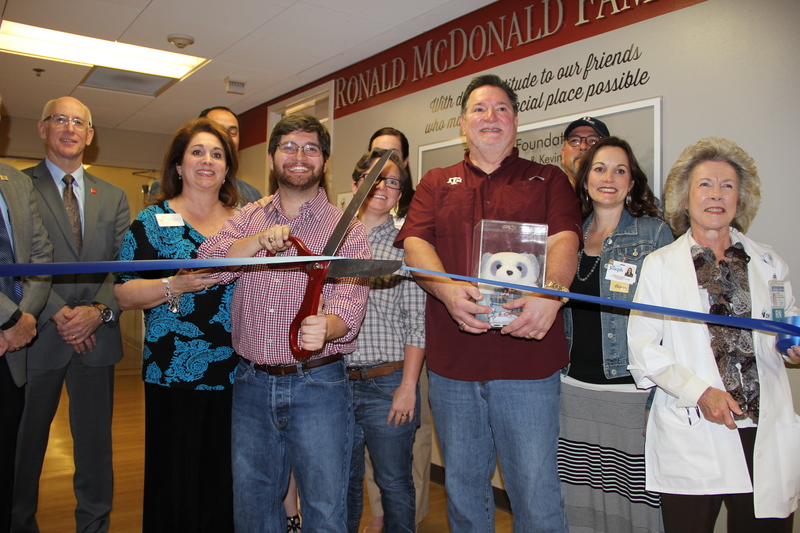 March 4, 2016 – CHI St. Joseph Health Regional Hospital and Ronald McDonald House Charities of Central Texas celebrated the opening of the new Ronald McDonald Family Room® with an official ribbon cutting ceremony and tour of the new facility. This is the first Family Room to open in the Brazos Valley. Ronald McDonald Family Rooms are comforting havens located inside the hospitals. The room is conveniently located near the neonatal intensive care unit and the pediatric unit at CHI St. Joseph Health Regional Hospital. Ronald McDonald Family Rooms offer families a nurturing place to rest and regroup while staying close to their hospitalized children. The room is officially schedule to open for families of patients on Monday, March 21. The partnership started almost one year ago, when Ronald McDonald House Charities of Central Texas and CHI St. Joseph Health answered a need for the community. The CHI St. Joseph Health Ronald McDonald Family Room is the fifth Family Room to open in the past seven years for Ronald McDonald House Charities of Central Texas. The space is just under 700 square feet with a living room, kitchen/dining, two bedrooms, a large bathroom and laundry facilities. Families also have access to computers, the Internet and a children’s play area. Established in 1936, CHI St. Joseph Health is a faith-based, not-for-profit health system committed to excellence and compassion in caring for the mind, body and spirit while creating healthier communities. CHI St. Joseph Health is comprised of five hospital facilities across the Brazos Valley, including CHI St. Joseph Health Regional Hospital, the region’s highest level trauma center. CHI St. Joseph Health Medical Group operates more than a dozen primary and specialty care clinics around the region, offering expert care, closer to home. CHI St. Joseph Health is a part of Catholic Health Initiatives (CHI), one of the nation’s largest health systems. Headquartered in Englewood, Colorado, CHI operates in 19 states and comprises more than 103 hospitals, including four academic medical centers and teaching hospitals; 24 critical-access facilities; community health services organizations; accredited nursing colleges; home health agencies; and other services that span the inpatient and outpatient continuum of care. For more information, visit chistjoseph.org. About Ronald McDonald House Charities of Central Texas Ronald McDonald House Charities of Central Texas, a nonprofit 501 (c)(3) organization, creates, finds and supports programs that directly improve the health and well-being of children. Through its Ronald McDonald House® and Ronald McDonald Family Room programs, RMHC CTX provides a “home-away-from-home” for families that keeps them together as their critically ill or injured children receive treatment in Central Texas- hospitals. The Ronald McDonald House is a 30 guest room, nurturing home-like environment and the Ronald McDonald Family Rooms are comforting havens located within five Central Texas hospitals. For more information, visit rmhc-ctx.org, follow RMHC CTX on Twitter (@RMHCCTX), or on Facebook (Facebook.com/RMHCCTX). CHI St. Joseph Health and Texas A&M Health Science Center College of Medicine break ground Thursday on their health and wellness center devoted to seniors. Known as the MatureWell Lifestyle Center, this two-story, 23,000-square-foot complex is a new concept in healthcare, offering a single destination for adults 55 and over to access a variety of outpatient services. A board-certified Geriatrician, a medical doctor specially trained to meet the unique healthcare needs of older adults. Geriatricians prevent, manage and develop care plans that address the special health problems of adults 55 and over. Medication Management from our onsite pharmacists. Rehabilitation Services with physical, occupational and speech therapists along with specialists in bladder and pelvic floor therapy. Health and Wellness Coaching providing customized wellness plans. A gym and indoor pool, offering state-of-the-art equipment, fitness classes and personalized exercise plans. Education on nutrition, disease and lifestyle management. Through the collaboration with Texas A&M Health Science Center College of Medicine, the MatureWell Lifestyle Center will also provide a forum for research to improve and advance unique healthcare techniques for our older population. These efforts will utilize a team approach through interdisciplinary experiences at Texas A&M Health Science Center, led by the Texas A&M College of Medicine. Conveniently located adjacent to the Texas A&M Biocorridor, a growing area of the Bryan/College Station community, the MatureWell Lifestyle Center will be constructed within the Atlas Texas Development located near Traditions Club. This planned development will also include a luxury hotel, Parc senior living community, shops, restaurants and other lifestyle amenities. The MatureWell Lifestyle Center will complement the area’s array of developing retail and business entities that are customized to meet the unique needs of seniors and the professional community. “Our region is forecasted to grow significantly in the 55 and older age category, with the population of adults in that age group growing five times faster than all others combined. Through the unique concept of the MatureWell Lifestyle Center, CHI St. Joseph Health will radically change the way seniors achieve their wellness and lifestyle goals, as well as manage chronic disease,” said Donovan French, Vice President for Strategy and Business Development, CHI St. Joseph Health. CHI St. Joseph Health and Texas A&M understand that as baby boomers age, they have different needs and expectations for their life. “We want seniors to continue to live vibrant, energetic and exciting lives, and good health is a key part of that. We know they also want to manage chronic diseases differently. Our patients are more educated than ever, and they want to be active participants and decision makers in their care. At the MatureWell Lifestyle Center, physicians and clinicians from CHI St. Joseph Health and the Texas A&M Health Science Center College of Medicine will help them achieve these goals,” said Kia Parsi, M.D., Medical Director Senior Service Line, CHI St. Joseph Health. About Texas A&M Health Science Center Texas A&M Health Science Center is Transforming Health through innovative research, education and service in dentistry, medicine, nursing, pharmacy, public health and medical sciences. As an independent state agency and academic unit of Texas A&M University, the health science center serves the state through campuses in Bryan-College Station, Dallas, Temple, Houston, Round Rock, Kingsville, Corpus Christi and McAllen. Learn more at vitalrecord.tamhsc.edu or follow @TAMHSC on Twitter. An extension of the acclaimed Traditions Club and Community, ATLAS is the first and only master-planned community in Texas created for companies engaged in the health and wellness fields. ATLAS offers a thriving planned community chockfull of lifestyle, employment and outdoor opportunities, including The Stella Hotel. Centrally located within The Texas A&M Biocorridor, ATLAS is adjacent to the Texas A&M Health Science Center and just two miles from Texas A&M University and Easterwood Airport. The College of Veterinary Medicine, new $32 million Equine Complex, Mays Business School, Texas A&M Research Park, National Center for Therapeutics Manufacturing and the Texas Institute of Preclinical Studies are all within 2.5 miles. ATLAS is adjacent to the Traditions Club and Community, providing access to its Jack Nicklaus/Jack Nicklaus II designed championship golf course, fine dining and luxurious home sites. This, combined with unparalleled entrée and proximity to world-class researchers and students locating within ATLAS, provides an ideal collaborative atmosphere for companies.